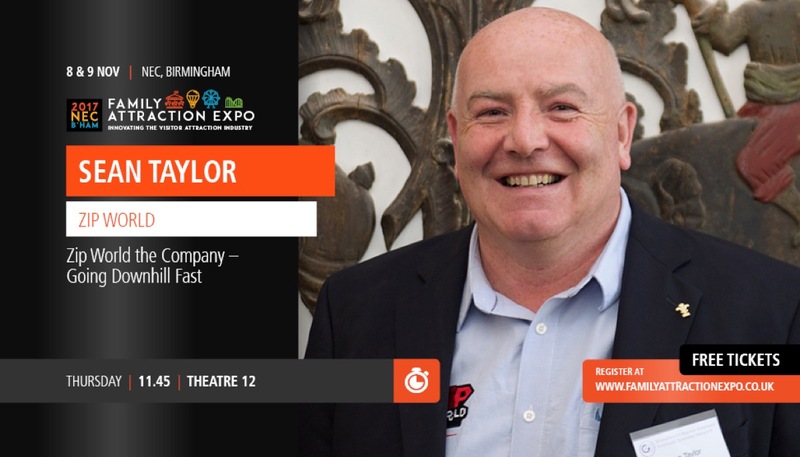 Sean Taylor will be speaking at the Family Attraction Expo in Birmingham this Thursday. This Thursday, 9th of November, Sean Taylor will be speaking at the Family Attraction Expo in Birmingham. He'll be talking about he Zip World story, before during and after. The potted history of a company that’s gone from 8 members of staff in 2013 to 350 staff in 2017. Seminar will include some video footage, no bad language and hopefully some smiles and laughs. Sean Taylor, Conwy valley born and bred, spent his early years as a Royal Marines commando followed by a stint as bodyguard for various celebrities. He then returned home after 26 years travelling the world to North Wales in 2007 and opened Tree Top Adventure, near the tourist town of Betws y Coed. This attraction soon became one of the most popular high rope adventure courses in the UK. Zip World came about through a dream of building one of the biggest zip lines in the world over a quarry. The dream came to fruition in March 2013 after 2 years in planning and construction. Velocity is the fastest zip line in the world and the longest in Europe, and as such was granted a large amount of media interest. Within no time at all, Zip World Velocity had had visits from the like of Ant and Dec and The One Show. The Zip World team went on to develop a range of other extraordinary attractions at two more sites in North Wales in Blaenau Ffestiniog and the former Tree Top Adventure site near Betws y Coed. Excited adventurers flock to North Wales to experience anything from bouncy nets in giant caverns to forest adventures. Zip World's expansion continues to grow with the imminent launch of the Adventure Terminal and the 150 cover Blondin's Restaurant at the Bethesda site and a 3 month zip line event in London during the summer months. It's Zip World's mission to bring extraordinary adventure to the masses.